Lemon herb quinoa salad combines all the tastes of a fine Mediterranean dish – cucumbers, tomatoes, lemon, and avocados. Served over kale for a delicious and simple dinner. Mediterranean flavors are my jam lately. What’s not to love!? It’s all simple ingredients that are just good for you! Although if I had my way, I would add a ton of olives! But I know everyone isn’t a fan of them (especially in my house), so I didn’t include them in this recipe. But if you’re a fellow olive lover, feel free to add kalamata or black olives! This lemon herb quinoa salad is chock full of yummy tomatoes, cucumbers, and avocado. To make sure you stay satisfied and full, it also has quinoa for some protein. All on top of kale! Remember, don’t skip the step where you massage the kale leaves. It sounds strange but really makes a difference. Lemon herb quinoa salad combines all the tastes of a Mediterranean dish - cucumbers, tomatoes, lemon, and avocados. Served over kale for a delicious and simple dinner. Meanwhile, make the salad dressing. Whisk together in a small bowl olive oil, lemon juice, water, red wine vinegar, parsley, garlic, salt and pepper. Set aside. Add kale leaves to a large bowl, drizzle extra virgin olive oil and salt to taste. Massage kale with hands for 1 minute. Add cucumber, tomatoes, red onion, and avocado to kale. Add in quinoa. Drizzle lemon herb dressing on top. 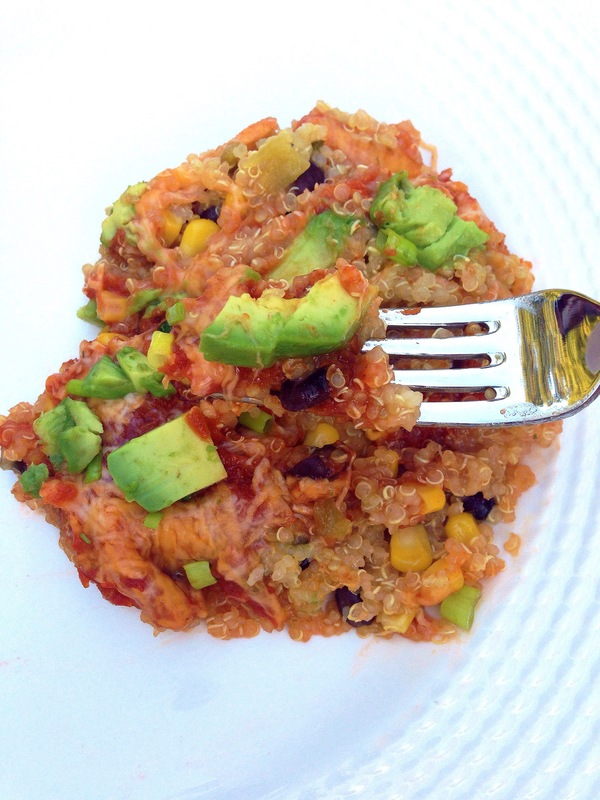 Southwest quinoa salad is delicious, fresh, and healthy! Easy to prepare in advance. Add the creamy cilantro dressing when ready to serve. Meanwhile prepare the salad dressing. Combine the Greek yogurt, lime juice, and salt in food processor and pulse a few seconds until mixed well. In large bowl add the black beans, corn, feta cheese, red onion, and cilantro. Add quinoa once finished cooking and top with dressing. 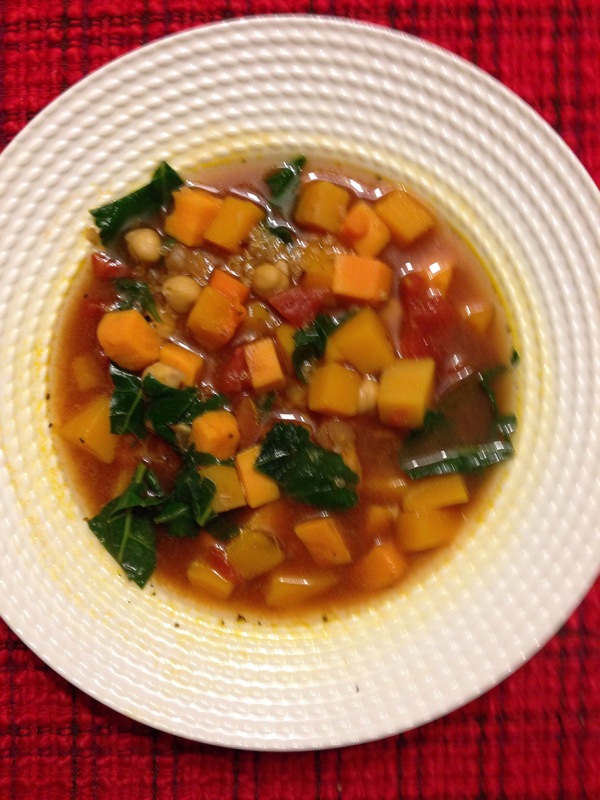 Even though we are far from vegetarians, my husband and I both love this soup. It’s a one pot meal, packs plenty of flavor, and between the kale, sweet potato, butternut squash, and quinoa, you will feel full and satisfied! Heat olive oil in a large stock pot over medium heat. Add onion and carrot and cook until the onions are translucent, about 5 minutes. Add the garlic, sweet potato, butternut squash, and bay leaves. Cook until vegetables are tender, about 10 minutes. Stir occasionally so they don’t stick to the bottom of the pan. Add the vegetable broth, tomatoes, and chickpeas. Stir in the quinoa and season with rosemary and thyme. Cook for 15 minutes or until quinoa is soft. Stir in the kale and cook for an additional 5 minutes. Season with salt and pepper to taste. 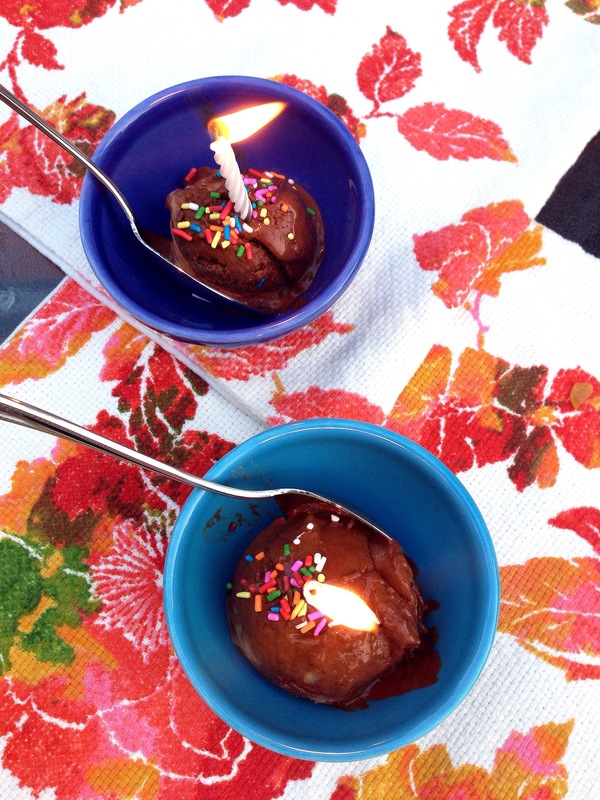 For the second week of Cooking with Hope, we are celebrating a very special birthday for my twin siblings! Hope and Sean, aka Sohope as they were called growing up, turn 20 today! YAY My parents can finally take a big breath; for the first time in 17 years, they don’t have any teenagers! Click here to read about the first week of Cooking with Hope. 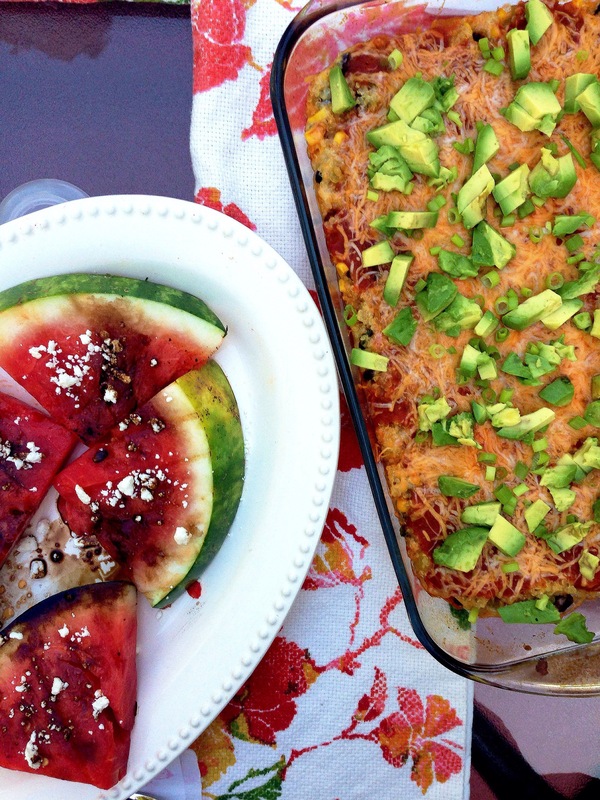 For their special day, Hope requested one of her favorite meals – Quinoa enchiladas from Skinny Taste. I made them once for her and she LOVED them. Also on the menu are grilled watermelon and homemade healthy ice cream! Everything turned out delicious and Hope learned how to make her favorite meal. The original recipe for the enchiladas can be found here. The one below is the one I made; it has a few minor changes from the original. The great thing about this recipe is it makes a lot of food; we had enough for leftovers the next day, and it gives you left over black beans to make a salad or quesadilla with. That’s one dinner and two lunches! Score! Cook the quinoa using 1 3/4 cups chicken broth and 1/4 cup water according to package instructions. Once done, fluff with a fork and set aside. Meanwhile in a small saucepan, heat the oil over medium low heat. Add the garlic and saute until golden brown. Don’t burn! Add the tomato sauce, 1/4 tsp salt, cumin, 1/4 cup chicken broth, and hot sauce. Bring to a boil and simmer 3-4 minutes. 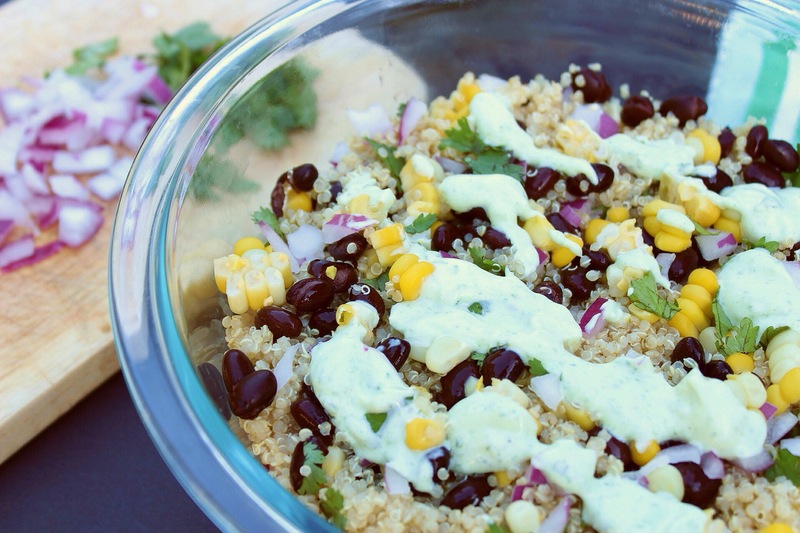 In a large bowl, combine the cooked quinoa, green chiles, corn, black beans, and 1/2 cup cilantro. Top with the hot sauce mixture and add remaining cheese. Top with avocado and scallions. I’ve been wanting to try grilled watermelon for a while, plus this made a perfect side dish to the quinoa. It tasted even better than I expected. 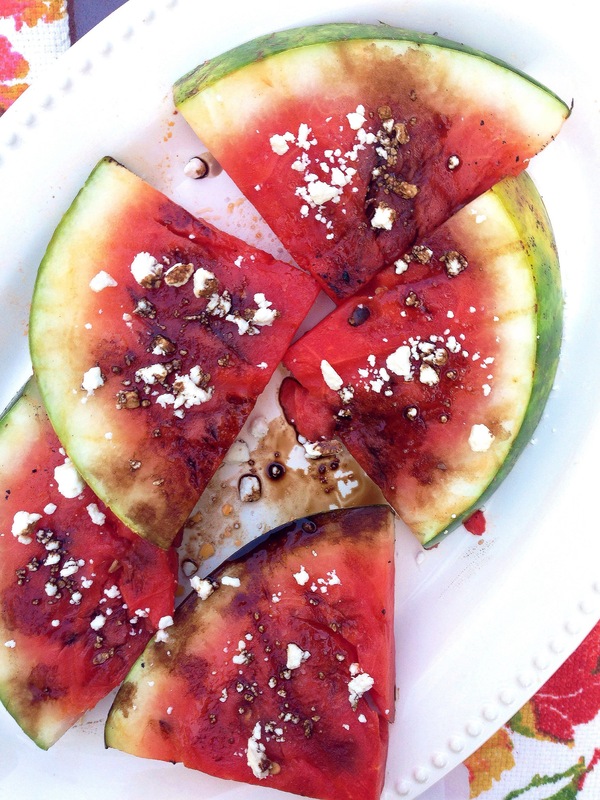 The salty feta cheese mixed perfectly with the sweet watermelon. Cut the watermelon in half through the center. Place the flat part on a cutting board and slice a 1 inch thick piece off, so you have a large circular piece. Slice the circle into even triangle pieces. Turn on the grill, season the watermelon with a thin layer of olive oil on both sides and grill until grill marks show on watermelon, about two minutes/side. Transfer to a platter and season with salt. Set aside. In a small sauce pan bring the balsamic vinegar to a boil and cook until thickens slightly about 5 minutes. Pour over watermelon pieces and top with feta cheese. 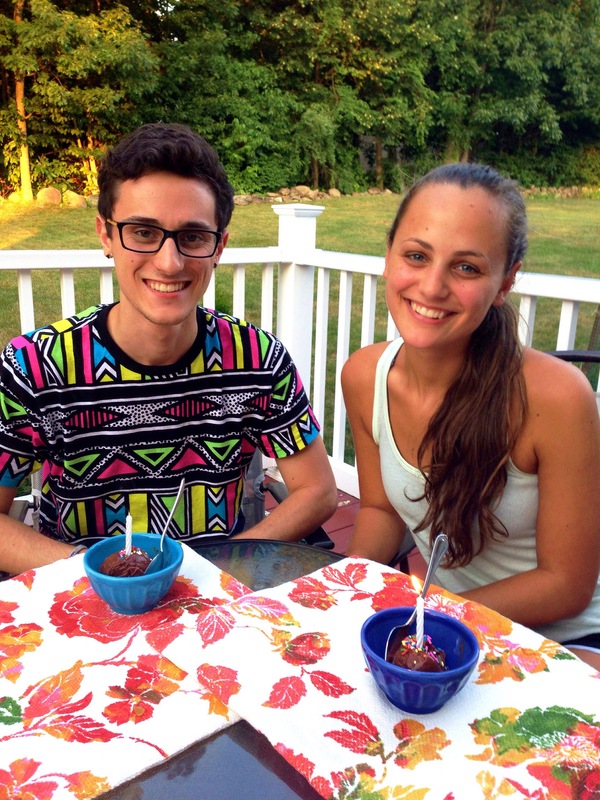 I have also been wanting to try this healthy ice cream for a while! Recently , I’ve been getting a chocolate craving after dinner and thought this would be perfect, except I didn’t have any frozen bananas. So this time I finally planned ahead! This recipe definitely hit my sweet tooth and I will be making it again! Pulse banana pieces in blender until smooth, add all other ingredients and pulse until incorporated. Transfer to a resealable container, freeze at least 30 minutes before serving.